Online courses have been around for a long time. Since the beginning, people have used the internet to communicate their ideas and knowledge. Even in the late 1990s, universities started hosting online courses. The first MOOC was launched in 2007. Then around 2012, online course platforms like Udemy, Skillshare, and CreativeLive started to take off. I’d like to say that 2015 was the year of the online course. But I also hope 2016 continues to be a year of the online course as well. Platforms like Teachable have allowed anyone with some sort of knowledge & passion to create and sell online courses on their own sites. I was lucky to start teaching in October 2012, and many of you have probably heard my story before. So I’ll give you the cliff notes version. I launched my first video editing course in October 2012, and made $62 that month. My mind was blown – seriously. Since then, I’ve created over 40 more online courses, learning from the best and have built a 6-figure business with VideoSchoolOnline.com that allowed me to leave my full time jobs and do what I love for a living – teach online courses and make videos. Whenever someone wants to get into teaching online courses, the first thing they ask is ‘What equipment do I need?’ I’ve answered this question so many times that I finally figured it would be smart to write an article about it. So without further ado, here are my favorite online course creation tools that I use every day to create professional online courses. I’m going to break it down into three basic setups. I use my DIY webcam setup when creating quick tutorials or other videos at my desk that include my face. Here’s an example where I review my Republic Wireless phone. These are videos that I do when I don’t have the time to do a full professional setup (see below). I have included some of these videos in my online courses, but lately I try to use the professional talking head setup for all of my online courses, and leave the DIY Webcam setup for quick YouTube videos. That being said, it’s a great place to start if you are new to teaching online. You’ll get great quality with the equipment below. The webcam that I use is the Logitech C920 (currently $60 on Amazon). It is a USB camera that can be plugged directly into my computer. To record video to my computer, I use a program called Screenflow – which is a screencasting and webcam recording software for Mac computers. There’s also a program called Camtasia, which is available for Mac and PC. Both Screenflow and Camtasia are great for screencast-based courses (see below). I’ll also just use Apple Quicktime to record videos (which is free). I also use this webcam when I’m doing Blabs (think Google Hangout mixed with Webinars and Live Q&A Sessions) or other video chats. It totally beats the quality of my built in camera (even though my 27″ iMac has a solid camera). Good sounding audio is so important for online courses. Especially when a lot of courses will be slide-based, with just a slide and voice over. Bad audio can kill your course. For my webcam setup, I use a USB microphone called the Blue Snowball. For around $50 on Amazon, this was one of the best investments into my online course business. Before, I was using the in-laptop microphone (sooooo terrible!!!! don’t do it!). Or I was using a more professional lavaliere setup (see below), but it was a hassle to set up, and a USB microphone is the way to go. 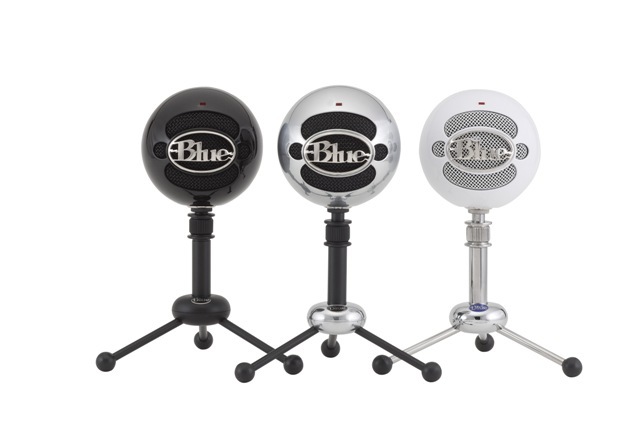 The company, Blue, also makes a higher end microphone called the Blue Yeti – but for those of you with minimal budgets just starting out, the Snowball will be just fine. I’ve recently invested in an even better microphone, the Heil PR 40, which I’ll talk more about in my screencasting setup. If you’re shooting with a webcam (or any camera for that matter), you need light. The more light there is, the better your video typically will be. One easy option is to just set your desk/computer in front of a window. But if you are shooting at night, this won’t work. And if you’re shooting during the day, the sun could be too harsh. A light curtain can help diffuse the light. Another option is a paper lantern setup. Right over my desk, behind my computer/webcam, I have two paper lanterns with cool fluorescent light bulbs. You’ll have to use a light socket and some sort of stand (I use a backdrop stand) to hang them. But for about $50, you can’t really beat the nice soft light that you get from these. This setup has higher quality video and is used during classes and to create my promo videos for my online classes. If my class contains a lot of lessons with me talking on camera or demonstrating something on camera, this is the setup I’ll use. You can see the sample video from my DSLR Video Production course above to see what it looks like. Compared to the webcam setup, the video just looks better. The background looks better (because of a shallower depth of field – i.e. making it more blurry). If you are serious about teaching online courses and plan to do a lot of talking head style videos, this is a setup you should consider. For those of you doing primarily PowerPoint / Slide-based courses, the next setup is what you will be interested in. I recently upgraded from a Canon 7D to a Canon 70D. The 70D is a great camera for shooting talking head videos of yourself because it has a great autofocus system that has face detection and a great ‘articulating’ touch screen which allows me to see the shot before recording. Mirrorless cameras like the Sony A7S are now the current hot ticket item. We could talk for days about which camera brand/model is the best. But when it comes down to it, any camera that allows you to use different lenses (like a DSLR or mirrorless interchangeable camera) will work well. Along with the camera, I recommend a standard zoom lens like the 24-70. As you can see, lenses start to get pricey. 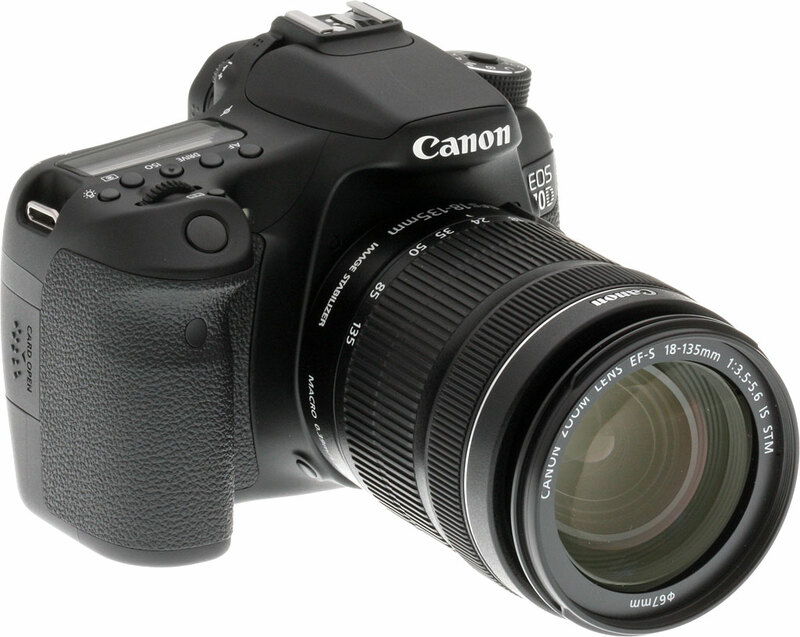 The Canon 10-18 is a cheaper options that works really well with the Canon 70D autofocus system. There are other brands like Sigma and Tamron that make great lenses. Just make sure you get the right lens for you camera body. You’ll also need a video tripod. I have a Ravelli Tripod that is solid for holding even larger cameras. It’s not the best at doing tilts and pans, but for online teaching you’ll mostly be locked off. You can see an even higher quality video below, where we used a Canon C100 in a studio setup. When shooting a talking head video with a DSLR, you probably won’t be sitting at a desk close enough to speak into a USB microphone like the Blue Snowball. You can either use a shotgun microphone or a lavaliere/lapel microphone that clips onto your shirt. I’ve been using a Sennheiser wireless lavaliere set for a few years. It’s the industry standard for wireless lavs. Most DSLR cameras don’t have a great microphone input, so you’ll have to record your audio using an external recording device like the Zoom H4N. As you can probably sense, this setup takes a lot more work and costs way more than the first setup. A cheaper lapel microphone options is a wired lapel that connects to your recording device with a long XLR cable. I have the Shure WL185 microphone. The lapel needs a pre-amp that also converts it to XLR. It’s $100 and does a great job recording my voice. It even works well outdoors, and doesn’t pick up much background noise. There are even cheaper lapel microphones, but audio isn’t somewhere to be stingy. You will thank yourself in the future for investing in decent equipment. For lighting these more professional-looking videos, I use a variety of setups. At home, I still just use the paper lantern setup from above. The good thing about shooting with a better camera, is it will look better even without great lighting. A big window in the room you are shooting might look just perfect. Just make sure the window is behind the camera, shining on you (and not behind you in your video). I also use a Lowel lighting kit or different light panel kits. These are bigger and take more work to set up. So when I’m at home, using my paper lantern setup is perfect. I leave it set up all of the time in my office, so it’s easy to go in there and start shooting. The screencast setup is what I use to do video lessons where I’m showing a PowerPoint slideshow or something else on my computer. This is what a majority of online courses consist of. While I recommend adding some talking head videos with either the DIY or Professional setup, you can get started with just this setup. This technically isn’t ‘video equipment,’ but there are specific applications that I recommend using for recording your screen. Screenflow and Camtasia are the most popular tools that online teachers use. With both of these programs, you can record your screen, audio from a microphone input, and even a webcam (if you want). After you record, everything is already synced up and ready to edit. Both programs have editing tools that allow you to edit your videos, add music, add titles, and do all sorts of other amazing things. Even though I use Adobe Premiere Pro to do most of my professional video editing, I have actually edited most of my online courses right within Screenflow. If you don’t want to shell out $100 for one of these applications, Quicktime Player has a screen recording ability and is already built into Macs. OBS is a free screen recording software for PCs that I’ve heard a lot of people using. The key thing is that you record at a high resolution (typically 1920 x 1080 or higher). That way, your videos are high definition quality. For the past two years, I’ve recorded all of my screencasts with my Blue Snowball microphone. Just recently, I purchased the Heil PR 40 microphone. It is the preferred microphone for thousands of podcasters and radio broadcasters. Some of my own inspirations like Pat Flynn of SmartPassiveIncome.com use it on their shows. From the few tests that I’ve done, the sound quality is much much better than the Blue Snowball. It’s about 6x as expensive (around $300 online), but the sound quality is worth it to me. It is especially good for people like us who don’t have fancy studio environments. Even in my office that typically has some echo, the Heil PR 40 did a great job at not picking up any background noise. The only problem with the Heil PR 40 is that you need additional equipment to plug it directly into the computer. I use my Zoom H4N recorder – which has an option for plugging directly to the computer. Otherwise, I would need a mixing board. To get started, try out the Blue Snowball. For the money, it does a great job and I highly recommend it. There is no lighting equipment for screencast videos. You could literally sit in a dark closet and record your courses – and hey, your sound might be pretty good then. Hopefully this detailed guide has helped you understand the basic equipment you’ll need to get started. I always tell people that tools are just tools. You are the artist. You are the teacher. There is no perfectly right set up – so use what you have now. Try to invest in at least a microphone. With that, you can use your computer and a free screen recorder to record you lessons. You can edit for free using iMovie or Windows Movie Maker. That’s a really low startup cost for a potential 6-figure business. Once you start making some sales, re-invest your money to buy better equipment. Let me know in the comments if you have any questions or comments. Are there other pieces of equipment that you use that I didn’t mention?